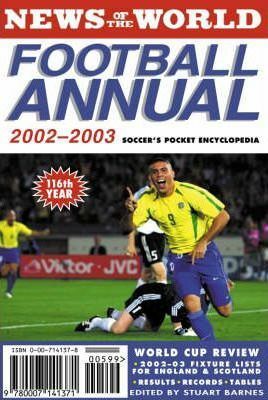 This title is fully revised and updated, featuring: all results from the 2001/20 02 season, including domestic European cup competitions plus international matches involving British teams; full fixture lists for the 2002/2003 season; all major European and world football awards; a soccer diary highlighting the season's biggest football stories; and an account of players and their appearances in the season for each and every league club. There is also a complete review of the 2002 World Cup qualifiers and the Finals tournament itself in Japan/Korea, with all the results and statistics from every match played. Stuart Barnes is a journalist for Hayters sports agency. Hayters are the country's leading supplier of sports information, and as such are uniquely qualified to produce this comprehensive annual.